I was on the train during post-work commute home, and my phone battery was already low, so I didn’t feel like draining it for no reason. Listening to music on the train, you get to people watching, and during my people watching, within my line of sight and peripheral vision, I counted about 9 people just staring at their phones from when I got on the train until I got off. Now, I realize that games on phones, and social media apps are great ways to kill time especially on a commute, and if you have music on your phones, you just scroll through, but at that particular time, a thought hit me like “why are we so fixated on our phones?” Have you ever been on the train and you’re not wearing headphones? It’s an eerie silence, because everyone’s just looking at their phones or listening to music. No conversation. It’s odd to me, but I get not everyone’s a morning person, and also, not everyone likes to talk to anyone after work. So what’s my point? It’s not just occurring on public transit that is weird, but in social gatherings, parties, clubs and concerts, it’s just people on their phones, looking down, with little to no interaction with others. I’m not going to act like I’m above everyone and say that I haven’t done it, but I question it. Have people lost the ability to talk to a stranger in person? 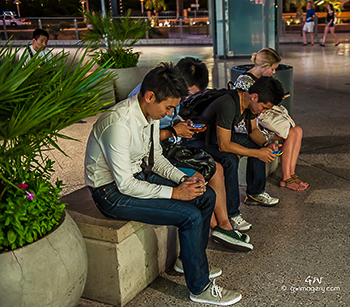 Social networks are making people less sociable? It’s weird, but it’s unfortunately the growing norm of the culture we live in. Everything is technological, everything is about instant access, and if you can get an answer reading in two words rather than hearing it from the voice of another person, that’s fascinating. TVs and Computers have been involved in the great majority of my life for as long as I can remember, but to witness the evolution of change to where computers, phones, and TVs have so much control over how people interact with each other more so on a digital level than with face to face interaction has been insane to witness and be a part of. You can do anything on a screen, and it’s a slow poison because I’ve seen people actually just sit in front of a TV or tablet and do nothing else…when you try to have a conversation about just about anything and you have to tell your friend to constantly put down the phone, there’s a problem. When you’re on a date, and the person you’re with has an unhealthy habit of reaching for their phone to check something in the midst of a conversation, that’s a problem. I don’t know why it is that we’ve become so dependent on technology that when it breaks down, all hell breaks loose. We can’t get on the internet, we can’t check an email, we can’t update a status, and everyone freaks out. The TV goes out, there’s no power; everyone freaks out. When you’ve been through a lot of blackouts, and had to experience a full summer without cable, I seem to have more tolerance with having less accessibility. It’s annoying when it comes to convenience, but there’s always something to do to pass the time, and that’s what I think a lot of people forgot to do. They forgot that there are other things to do besides sit and wear their eyes down in front of a screen for hours on end. We live in a world where we like things to be right in front of our fingertips, and if we can’t have it right away, everyone throws a fit until it’s there. It must be different in other parts of the world, but in a North American society where everything is Go-Go-Go, we really need to learn how to turn it off, unshackle ourselves from the batteries, and simply relax. The world looks better with your head up, and it’s definitely less stressful on the neck.